Windows Phone is Microsoft’s fledgling response to the overshadowing forces of iOS and Android in the smartphone industry, and having partnered up with Nokia to bring a very slick user experience on WP7.x, the two companies are a collaborative force once more, and at the forefront of the big Windows Phone 8 push. About a year ago, my colleague Oliver – a fairly partisan Apple fan as many of you will know – ditched his beloved iPhone, and gave the Windows Phone 7-running Lumia 800 his undivided attention for a whole fortnight. A brave move it was, and although he had plenty of praise for the Nokia-made device and the platform in general, he was obliged to echo the sentiments of the general population. The lack of apps made WP7 feel “disconnected”, and although there were other, somewhat less severe caveats, a smartphone without adequate app selection is always fighting a losing battle. Still, WP7.x was given the benefit of the doubt, and rightly so. But with a dedicated store, projections of many thousands of apps arriving, support for multiple cores, Live Tiles, and the rest, Windows Phone 8 doesn’t have that kind of grace period, and the pressure is certainly on Microsoft to make a dent in this very competitive market. 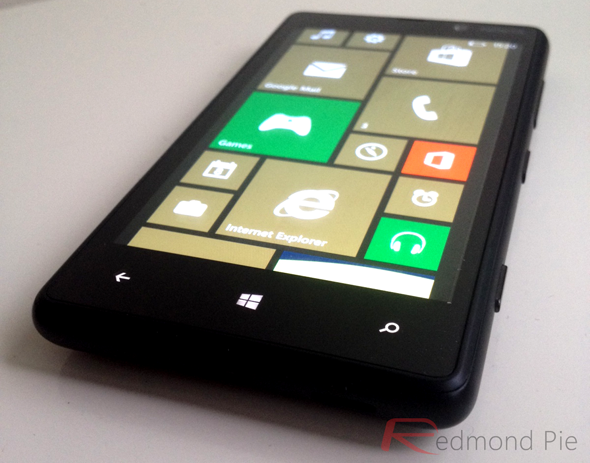 Nokia has been kind enough to supply Redmond Pie with a Lumia 820 running Windows Phone 8, and to assess whether Windows Phone 8 has progressed from a year ago, I’ll be ditching the iPhone and going in head-first with the Nokia handset. Since the device itself has been around for a while, we shan’t bother with a full-on review, although you’ll get a good idea of what it’s like to use a Lumia 820 running Windows Phone 8 when I report back in two weeks’ time. I don’t own an Android smartphone at present, but have done in the past, and managed just as comfortably on that as I currently do on the iPhone. However, I do use my Nexus 7 for gaming, e-mail, and other such digital activities from day-to-day, so in order to really throw the Lumia 820 into the deep end, I’ll be ditching that, too. Considering I use iMessage almost by the minute, enjoy Spotify on those moments when in need a fresh playlist, and, perhaps more significantly, haven’t ever used a Windows Phone for more than five minutes, I have to say, I’m slightly worried I may have bitten off more than I can chew. On the flip-side, I am buzzed to see whether Nokia, and of course, Microsoft, have delivered an all-round product ready to challenge the might of the Big Two. When I report back, I’ll be looking at some of the key areas, like ease of use, availability and quality of apps, and also, adaptability. I mean, given the relatively small market share of Windows Phone thus far, it stands to reason that many of you, like myself, will not have had any noteworthy interaction with a Windows Phone device of any description. I presume some of you will have done what I’ve been doing since Windows Phone first arrived to the market, in considering migrating, without really considering migrating. If you’re perched upon the proverbial fence, stay tuned, as I will be reporting back after two Nokia-enriched weeks with the Lumia 820. If you have any questions or thoughts on Windows Phone 8, and wish to contact me directly, my Twitter handle is @_benreid, once I have figured out how to get The Twitters up and running on the Lumia, of course.